Opened on 23 February 1940 by Lucas & Jenkins, the Elbert Theatre was damaged by fire in 1950 but reopened soon thereafter. It stopped showing movies in 1967 and for a time served as a youth center. Purchased by the city in 1989, it was eventually restored for use as a theatre in 2001. 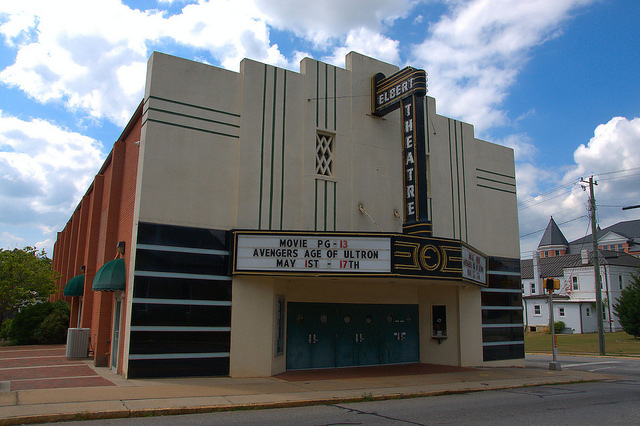 Today, it hosts live shows and first-run movies. Many were the days that I would spend all day on Saturdays there with Roy Rogers, gene Autry, or Johnny MacBrown on my 14 cent admission.